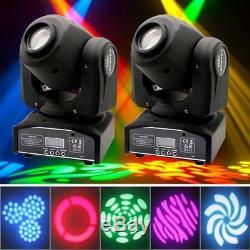 2PCS 30W Stage Light RGBW LED Moving Head Light DMX Beam DJ Disco Bar Party Lighting. Mini moving head light design, compact structure. Excellent temperature protection, high safety and reliability. Unique design, uniform blending effect. Combined with a variety of patterns to highlight atmosphere. Compact structure, easy installation and stable performance. Support DMX512, sound control and self-propelled operation. Material: Aluminum alloy + PVC. Color effect: 8 pattern + shake + pattern rotation speed, 8 colors + half color effect + color rotation speed. Sport mode: automatic operation, voice, DMX512, master-slave. Built-in program: standard voice, self-propelled, master-slave, DMX. Scanning angle: 540 °, speed can be controlled, 270 °, speed can be controlled. Cooling system: constant temperature + fan. Features: Mini-pattern moving head light, compact structure, the output is good, with a variety of patterns, easy installation, easy to carry, moving in light weight, projection accuracy, good effect. Use: for dance halls, KTV, PARTY, home decoration lights are widely used in the stage, wedding, and other different occasions; increase the romantic atmosphere. Designed into small size and light wight for easy installation, this portable stage lamp will bring you endless convenience in daily life. You can also project different beam effects for magical viewing enjoyment. And the beam effect could diffuse bigger and bigger. By using high-grade material and with exquisite workmanship, this stage lamp ensures excellent safety, environmental protection, low power consumption and high brightness. Our U`King ZQ-B54 1-LED 8 Rotary Pattern Effect DMX-512 Self-propelled Sound Control LED Stage Lamp is really a must-have for ballroom, KTV, party or other entertaining places. Please rest assured that quality is ensured. We will always here to solve it for you. If you are satisfied with our products and our service, please tell your friends and leave us a 5-star positive. Feedback; if you are not satisfied with our products or service, please DO tell us. Brand new (Unless the description shows used), first quality, with all original parts and authentic. Not refurbished, factory seconds, or replica products. Our company is located in Shenzhen, China, with 10,000 product, we professionally produce outdoor, LED products, there are flashlights, stage lights, laser pointer, model aircraft and other electronic products, we also have professional certification ROHS, FCC, CE certification. We believe that everything could be solved by communication. Feedback is simply what we pursue. If you have any problems, we are very glad to help you. We handle large volume emails every day. The functional products in our shop, which function as the description, but the actual color and shape looks a little different from pictures because of the technical improvement and actual stock state. The item "2PCS LED Stage Light RGBW 30W Moving Head Light DMX Beam DJ Disco Party Lighting" is in sale since Tuesday, September 26, 2017. This item is in the category "Bastel- & Künstlerbedarf\Schmuckherstellung\Perlen, Schmucksteine &-kugeln". The seller is "wwwt8501" and is located in Frankfurt, Hessen. This item can be shipped to all countries in Europe, Canada, Australia.